Yang Mi (楊冪) is known to dominate television ratings, and boost the popularity of her male co-stars. After last year’s Eternal Love < 三生三世十里桃花> became a mega hit and made Mark Chao (趙又廷) into one of China’s most bankable stars, Yang Mi is once again giving her magical touch to Legend of Fuyao <扶搖> and leading man, Ethan Ruan (阮經天). Broadcast since June 19 on Zhejiang Satellite TV, Legend of Fuyao has already surpassed 1.3 billion views. 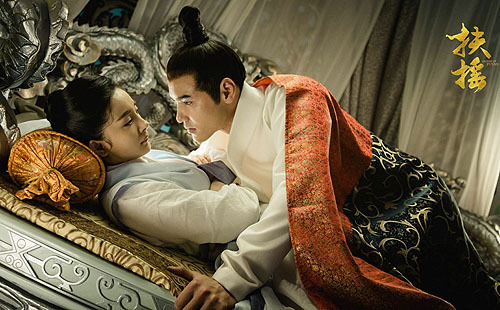 This is impressive as the FIFA World Cup is currently airing, yet Legend of Fuyao is still able to draw in significant views. Many fans attribute the drama’s success to the strong chemistry between Yang Mi and Ethan Ruan. The studio teased fans today by distributing Yang Mi and Ethan’s “bed photos” in upcoming scenes, which quickly stirred up discussion. When Yang Mi demonstrated what she meant, Ethan was quickly stirred and got goosebumps from head to toe. But Ethan followed Yang Mi’s advice to full effect during their romantic scenes together. As it has been several years since Ethan appeared in a television drama, he was asked why he agreed to film Legend of Fuyao, an ancient drama genre which he is rarely seen in. Ethan replied that when he heard Yang Mi would be in the drama, he immediately accepted because he had confidence in her ability to draw viewers.